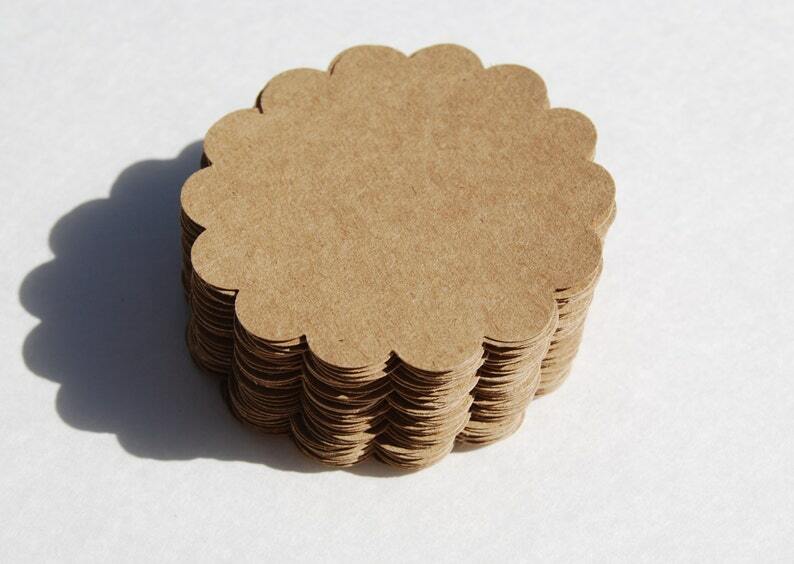 You will receive 50 Kraft Scalloped circle die cuts, hand punched. These little circles are great for scrapbook and cardmaking projects, gift boxes,labels, favor bags, gift tags, party decoration and invitations, wedding tags,stamping and wishing tree tags! The scalloped circle measure 2 1/4" diameter. *I've attached color palette photo for you to choose if you would like to have different colors than I offered on this list. Simply choose "From Color Palette" from options and note the number of the color you want. If you need mutiple colors or other customized colors. Feel free to contact me before your order and we will make it work! *I hand picked 25 colors that are popular since I opened my shop. They are 5 kinds of assorted color cardstock pack from michaels. I also labeled name of each pack so you can check out the colors in person if you would like to. We are updating store items daily. Please come back to find more wonderful goods! nice quality and quick to ship! They were just as described and came in cute packaging. Just what I needed for my Etsy orders.